The Secure Stores Forum isn’t a trade show, in fact, it’s everything a trade show isn’t. It’s a uniquely targeted way to present your service or product to an audience of senior security and loss prevention buyers at major retail chains in a quiet, productive resort environment. You’ll be with a select group of only the most senior and most interested retail security and LP buyers. 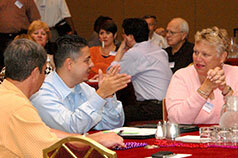 We hand pick each of our delegates, so only those with buyer power are in the room. You’ll demonstrate and explain your product in a quiet conference room setting with no distractions. You’ll also have private one-on-one meetings to discuss buyers’ specific needs. And you’ll have two days of relaxed networking activities, meals and time to know your prospects on a more personal level and understand their needs. More Effective Than a Trade Show. You’re never waiting around hoping a buyer will wander into your booth. You’re meeting with buyers who have requested to see you and your time with them is by appointment. You’ll present your product story in a quiet conference room with no competitors in the room. Just you, your prospects and the time and focus to explain what you offer. And you’ll have one-on-one appointments with buyers who have requested to meet you. 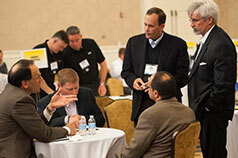 Build relationships with buyers during two days of lunches, dinners, drinks, cigars and fun evening networking events. You pay just one price for everything. Your hotel rooms, your meals, your meetings, audio-visual support for your presentations, even your airport transfers are paid for and arranged by us. And there are never any surprise extra costs: No booth to ship, no carpet to rent, no labor to hire. In short, no hassles! What Kinds of Suppliers Participate? You'll be our guest at the beautiful Westin Lake Las Vegas Resort. Named as one of the "World's Best Hotels" by Travel + Leisure, you'll retreat from the neon lights of the Las Vegas Strip to a newly renovated 3,600 acre lakeside paradise.